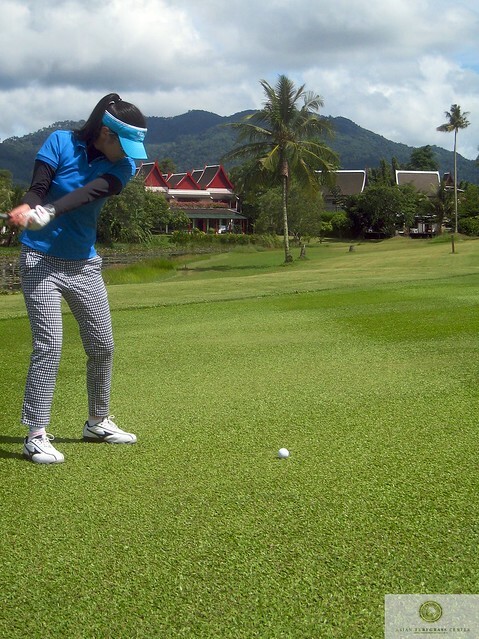 Golf in Thailand at this time of year is really pleasant. I often use the words clement and salubrious, with additional modifiers, to express just how pleasant I find it. Over the past 20 days in Bangkok, there has been no rain, and the temperature has ranged from 19 to 34°C. I've written about the grasses one finds here, and I have also put together this photo gallery of the typical grasses. Most putting greens are hybrid bermudagrass, and after that comes manilagrass, and there are comparatively few courses with seashore paspalum greens. Through the green, the percentage of courses with bermudagrass goes down, and the percentage with manilagrass and seashore paspalum comes up. 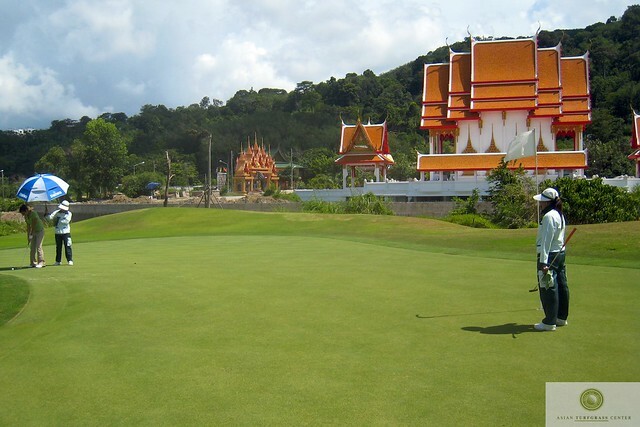 At the Sustainable Turfgrass Management in Asia 2015 conference, we will be talking about these grasses, and we will have a pre-conference seminar in which we discuss the design and construction of golf courses in Southeast Asia. It hasn't rained in Bangkok for 20 days, yet on the seashore paspalum fairways I played today, this was the result from multiple shots that landed in the fairway: debris (organic matter, or mud?) on the ball. I think the cause of this is related to the grass species. In Southeast Asia, when one does not keep the soil wet, seashore paspalum will eventually be overtaken by better-adapted species that thrive in drier soils. So seashore paspalum fairways must be kept really wet if the grass is to persist. One can topdress with large amounts of sand to minimize that problem, but that is really expensive. A recent post on GolfClubAtlas.com about seashore paspalum had some interesting comments from golf course superintendents and golfers and architects about this species. The consensus -- it requires a lot of inputs and can be very expensive to maintain. I've got lots of ideas about grass selection and construction methods (especially sandcapping of fairways) and will be working on developing those for discussion at the upcoming conference. Tropical carpetgrass part 2: ugly duckling or swan? When I wrote about tropical carpetgrass being an unappreciated grass, the conversations (1 & 2 & 3) that ensued showed a mixed response. Some people really like tropical carptegrass (Axonopus compressus), and others have no use for it. It was rightly pointed out that in a a subtropical environment, tropical carpetgrass will not be ideal throughout the year, especially when it is cool. And like other grasses, there will be issues with drought tolerance, and traffic damage, and so on. Where this species is really well-adapted is in tropical climates that receive more than 1,000 mm annual precipitation; one wouldn't want this grass where precipitation is less than 800 mm. It is not a perfect grass, even in the tropics, but no grass is. So why do I persist in writing about tropical carpetgrass? Because for many tropical sites, this is the grass that should be used, and it has some very attractive characteristics that are especially relevant to the way I think about turfgrass management. When possible, I think we should manage turf with a minimum amount of inputs. Tropical carpetgrass, more than other species, can be maintained as a multipurpose turfgrass with the fewest inputs. Last year I was interviewed by Matt Adams on the Fairways of Life radio show. You can listen to the interview here. Today more and more, there is pressure upon every golf facility in terms of how they maintain the golf course – the general line that we're hearing is that golf courses need to embrace more of the brown because water is at such a premium anywhere and everywhere around the world. Then he asked, how can the type of grass chosen help us out in terms of maintainenance cost and availability of water? Rather than talking about using more resources and spending more money, the focus at the global level is to use less resources in turfgrass maintenance. We cut our maintenance expenses greatly, because we just focused on what's good for golf, and interestingly, no one complained. With tropical carpetgrass, in a tropical climate with annual precipitation of at least 800 mm, and preferably with 1,000 mm or more, this grass requires only mowing. It can be maintained without fertilizer or pesticides, and irrigation is only required if one wants to make the grass green, or if the turf is to be heavily trafficked with golf carts. There will be many golf courses or turf managers that prefer to grow and manage a grass that has different characteristics. But let's not forget about the many good characteristics of the multipurpose tropical carpetgrass. As the recent research from Trinidad and Nigeria demonstrates, this species has a number of advantages compared to other turf species in a tropical environment. It makes a dense, uniform turf even on pure sands and the leaves are stiff enough so that the ball is always well off the ground. The only other grass to compete with it is Bermuda; but under conditions where both will grow, carpetgrass makes far superior turf. Tropical carpetgrass is the climax species as a managed turf in humid tropical climates. But it is barely mentioned in turfgrass textbooks, probably because the authors have focused primarily on the grasses in common use in the United States. This is unfortunate, because tropical carpetgrass has a number of advantages as a turfgrass compared to species such as bermudagrass (Cynodon) or seashore paspalum (Paspalum vaginatum) that are sometimes planted in tropical environments. For example, it is possible to maintain tropical carpetgrass with no supplemental fertilizer, no irrigation, and no pesticides. In fact, that would be standard maintenance for tropical carpetgrass in many places – mowing, and not much else. 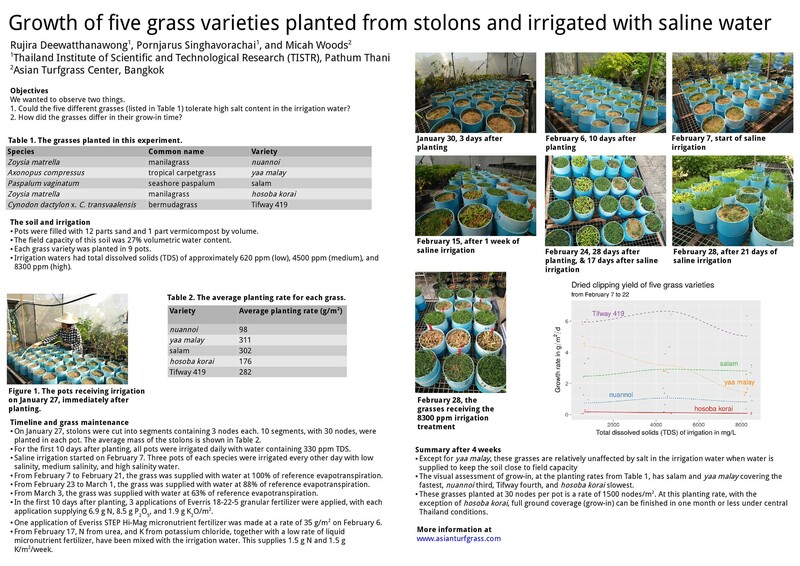 With these advantages compared to other grasses, it is encouraging to see two recent papers that have investigated some characteristics and performance of tropical carpetgrass. Springer et al. compared bermudagrass, zoysiagrass, and tropical carpetgrass (they use the name savannahgrass for Axonopus compressus) at the University of the West Indies. They measured how much these grasses grew, and what quality they produced, when subjected to drought stress, waterlogging, and soil compaction. This was done in soil and in soil profiles with a surface sand layer to simulate the effects of sand topdressing. The full paper, Comparative Evaluation of Common Savannahgrass on a Range of Soils Subjected to Different Stresses I: Productivity and Quality, shows that tropical carpetgrass (savannahgrass) generally performed better in the growing environment of Trinidad than did the bermudagrass or the zoysiagrass. Averaged across all the stress treatments, tropical carpetgrass had the greatest clipping yield and the highest chlorophyll index. Zoysiagrass had the highest visual quality averaged across all stress treatments, with carpetgrass just behind, and then bermudagrass having the lowest visual quality. Springer et al. concluded that tropical carpetgrass "showed a higher level of tolerance to applied stresses and warrants greater attention as a potential turfgrass under tropical conditions." In Nigeria, Oyedeji et al. investigated tropical carpetgrass and other local grasses. Their paper, Performance of Some Local Nigerian Turfgrasses in Sole and Mixed Stands, shows data that again make a strong case for tropical carpetgrass as a turf in that climate. Compared to other grasses, tropical carpetgrass performed well, especially in the recovery after 2 weeks of daily trampling with soccer boots. In a tropical climate, it is hard to find a grass that outperforms tropical carpetgrass. One of its advantages as a turfgrass is its adaptability to a range of mowing heights. Tropical carpetgrass can be maintained with almost no inputs, except for mowing, and in addition to that, it can be mown at heights from 3 mm to more than 100 mm. Thanks to the Penn State Turf Club, I received a Nittany Lion in today's mail. The Club selected our (Gelernter, Stowell, and Woods) article from the December 2013 issue of Golf Course Management for their Article of the Year Award. Without the ability to measure it, sustainability remains a mushy, confusing and frustratingly unobtainable goal. Without quantification, evaluating the achievement of sustainability goals becomes wholly subjective — in the eye of the beholder. Although you may think you’re doing a great job, you have no way to communicate it or to prove it, unless you have some way to measure and document it. In this article, we present several simple monitoring approaches that can help take the mush out of sustainability, and instead treat it as a measurable, science-based agronomic phenomenon. All of these procedures can easily be put into practice at your facility." I'm thrilled that this article has been so well-received and that the Penn State Turf Club saw fit to choose this article for their award. Thank you!